Windows 10 is a true cloud-based operating system that includes both cloud and local elements designed to provide an experience that seamlessly roams across devices and automates the manual tasks of keeping Windows up-to-date and your PC protected. We expect our operating systems to be reliable and perform well at all times but problems do happen. Windows 10 is smart enough to detect and report them to Microsoft so Windows 10 can be improved, but this capability along with many other elements of Windows 10 can impact your privacy. In this article, I will review the privacy features in Windows 10 to help you find the right balance. It is important to note that Microsoft does not intend to collect any of your personal information that is not necessary to operate and maintain Windows 10. They do not track what you do personally on Windows 10, however, information is sent to Microsoft. For example, if you use the Microsoft Edge browser, the SmartScreen service that protects you and your PC from visiting websites that are known to host malware, must send the URL to the service to check. For this service to work, it must send the URLs of the sites you visit to the online service at Microsoft. Microsoft promises not to use this to track you, but on the surface, this may concern you. Do you want to protect yourself against a malicious website or do you want to hide what you are doing from absolutely everyone? This is the perfect example of the type of tradeoffs we must make in the world we live in now. Another example involves reporting diagnostic information. Windows 10 is full of a lot of performance and usage reporting known as telemetry. Microsoft uses this reporting to ensure Windows 10 is operating appropriately on your unique configuration of hardware and to identify how Windows 10 is being used in general. This information is used to identify features that users like and other features that are never used so they can prioritize development decision. In addition, when problems arise, they are reported to Microsoft so that they can be fixed. All of this information is collected and reported in an anonymous manner, so some random Microsoft employee can’t go snooping around your data, but this can be a major cause of concern for a lot of people. In the latest update to Windows 10, Microsoft has made it easier than ever to find the privacy settings and make changes to both what is collected locally, and even delete what has already been collected and stored in the cloud. All of this can be access by clicking the Start Button, type in Privacy Settings and hit Enter. 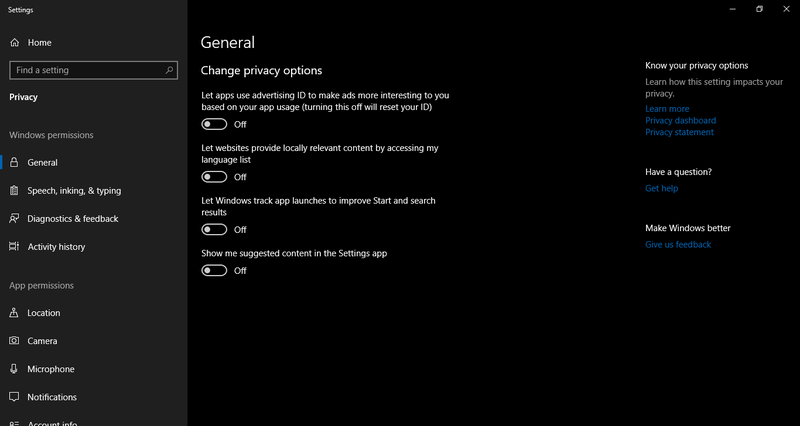 The new privacy settings section will load that will display dozens of settings you can fine tune organized between Windows permissions and App permission. I feel these settings provides a nice balance between maximizing privacy and using the modern features of Windows 10 that do provide value.